How do time changes affect seniors with dementia? It’s springtime in Florida now, which means we’ve already sprung forward, and our nights are longer and our mornings a little darker. At least until it’s time to Fall back and Daylight Savings Time ends. If you’ve noticed that these changes have an impact on your loved one with dementia, you are not alone. 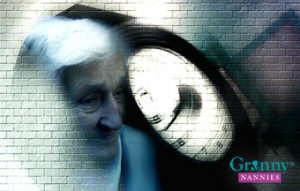 How are time changes linked to dementia? The thread is called sundowning. Folks who have Alzheimer’s diseases and other forms of dementia may have a condition known as sundowning. This is described as late in the day confusion or increased agitation. Since we all have an internal clock, which natural light and circadian rhythms impact, even just an hour change backwards or forward on the clock can disrupt our sleep/wake cycles and leave us off kilter for a while. Shifts in natural light are partially why sundowning occurs, so messing with the timing and amounts of daylight complicates things more. Let’s put this into a real-life context: Your loved one with dementia may have lost the concept of time long ago. However, when it’s only 5:00 p.m. and it’s already getting dark, he or she may be stressed out because the outside world doesn’t look or feel normal. More real-word context: Every dementia patient has a routine, and the smallest adjustments can be very disorienting for them. Because of a time change in the Fall, a patient will be eating supper when the sun is setting or down. If it’s Fall and the sky is darkening, experts recommend turning the inside house lights up before the sun starts setting. Other tips to sooth a sundowner: Playing their favorite music can keep them calm and content; Plan evening activities that are low key and not too complex to avoid increased disorientation and frustration. Maybe even consider what parents of young kids do to deal with bedtimes during clock changes: they put the kids to bed 15 minutes later or earlier a few days ahead of the clock change. Most of all, even if you are a very competent super hero, you may not be a lucky caregiver who can futz with the timing of your loved one’s routine without much of an issue when the time change comes. The best thing you can do is be prepared and try to make the transition as smooth as possible.